While checking out the site of the future Fostoria Rail Park this Norfolk Southern freight crept very slowly around the curve. 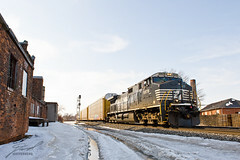 This GE C40-9W, numbered 9978, was dragging a short train of autoracks into yard just beyond. It gave us a good opportunity to grab some shots, but the lighting and sloppy ground didn't cooperate.